Use spring scales to pull shoes across surfaces to measure the friction between the shoe and the surface. Shoes are manufactured with many different soles, depending on the function of the shoe. (For example, runners have rubberized and inundated surfaces to grip the ground, whereas tap shoes have slick metal soles to enable the dancer to click out a rhythm and slide on the dance floor.) Friction is the force that counteracts a shoe and surface sliding past each other, caused by the surfaces rubbing against each other. A flat sole or a polished floor will generally reduce the friction between shoe and floor as the flat surfaces slide past each other more easily. But friction is a complex force determined not only by the roughness of the surfaces, but also by how hard the surfaces are pushed together (for example by the weight in the shoe), the chemical material that the surfaces are made of and whether there is any fluid between the surfaces. In addition, the force of friction opposing an object starting to move (“static friction”) is different from the friction once an object is moving (“kinetic friction”). Refs 1 and 2. Pulling different shoes across different surfaces provide a system that is easy to set up and can explore all these aspects of friction. The force between two materials, that stops them from sliding past each other. Two surfaces that slide past each other every day are the bottom of a shoe and a floor. Tell students that they will be measuring the friction between their shoes and the surface of their desks to start, before exploring other surfaces. 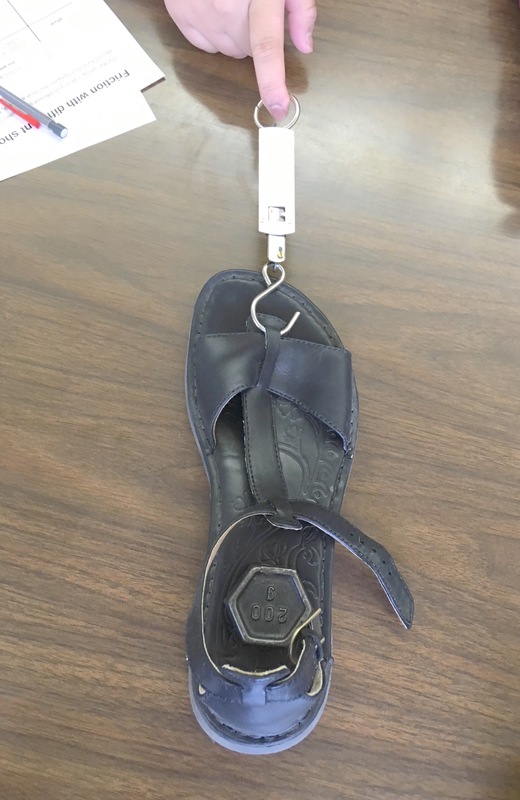 Show students how to measure the friction between a shoe and their desk, by hooking the spring scale through a strap or lace on the front of the shoe, then using it to pull the shoe along. They should pull the shoe slowly but steadily until a consistent reading is obtained. It is often easier to have one person focusing on pulling the shoe while another reads the scale. Allow students to choose their shoes and take their readings, but makes sure that each group tries a cleat, tap shoe, or other shoe with a slick sole. Students will need a circulating adult to check that they are measuring sliding friction (as the shoe is moving) and not static friction (as the shoe just starts to move), as static friction will be a lot higher and give inconsistent class results. 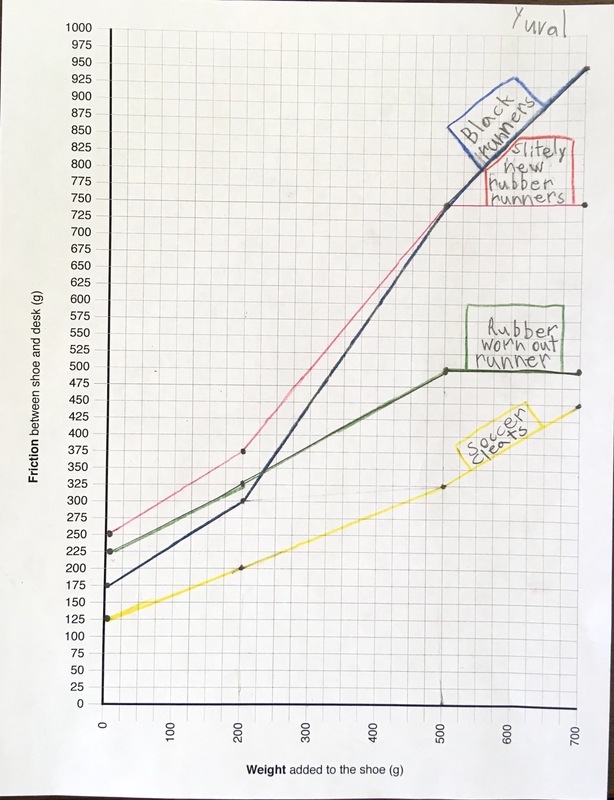 Once all groups have readings for at least two shoe types, ask students to graph their data on the graph paper worksheet. While this is in process, gather some student data to recreate a graph on the board. Students should find that for every shoe, increased weight caused an increase in the friction. Why is this? If the shoe and the surface are pressed together more firmly, the tiny bumps and indentations in the shoe and surface get caught up in each other more so increasing the friction. The shoes will vary in their friction, sometimes in surprising ways. In general though, tap shoes or other slick dance shoes will have less friction, cleats will have less friction, and some (though not all) worn out runners will have less friction. Discuss these results, including comments on how flat the surfaces are (tap shoes are very hard and flat, worn out runners can be very flat) and how large the contacting surfaces are (cleats are hard plastic and only contact the table in small spots). Also discuss the materials that the shoes are made of. Some runners have soles that are rubberized, which is a tacky material which sticks to surfaces and is hence high friction. Tell students that they will be measuring the friction between one shoe and several different surfaces. Distribute different surfaces around the classroom, while naming each one for the students e.g. carpet, a piece of foam, a layer of sand in a tray, a tray of ice. Also point out the floor of the classroom and any other surfaces that are different from the desk tops. 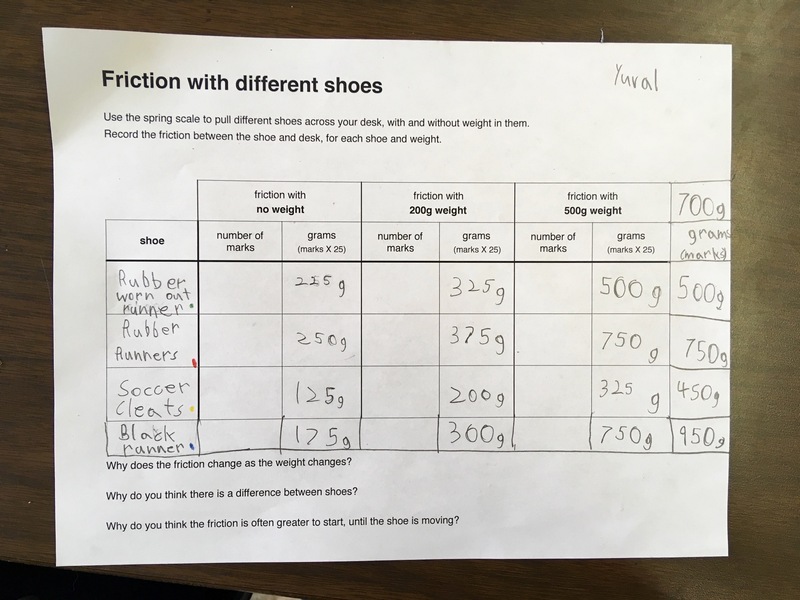 Tell students that their group should choose one shoe and one weight, and measure the friction on different surfaces. They should start with the desk top once again, then move to different surfaces. Using the worksheet “Friction with different shoes” (page 2 of the attached worksheet), they record the friction for each surface, as well as the change in friction from the desktop in each case. Note: as the students work, the ice tray will need to be maintained - pour off the excess water so that the shoes are moving across the ice, not a puddle of water. Carpet and foam - the carpet and other knobbly surfaces have lumps and bumps which get caught up in the (sometimes tiny) bumps in the sole of the shoe and increase friction. Foam may give differing results, depending on what kind it is - although bumpy it may have a slick texture that can make surfaces slip past each other and so decrease the friction. Sand - sand in a thin layer will likely decrease friction. This is because the individual grains can roll. Rolling is a low friction motion, as the surfaces do not slide past each other but rotate past each other. Students can relate to marbles on a floor and how their rolling motion can be hazardous if stepped upon. If the sand is deeper, the friction may increase. Ice - if there is a very thin layer of water on the ice, the liquid will fill the bumps and grooves on the sole of the shoe, allowing it to slide over the ice more easily, hence reducing the friction. Lubricants such as oil, grease and wax work in the same way to reduce friction between moving parts of a machine or other object. 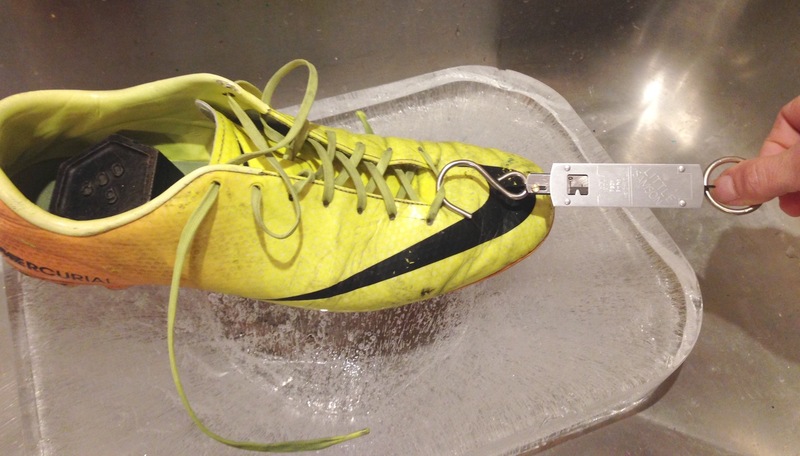 With more water on ice, the friction may increase as the shoe has to push through the puddle. Friction is a complex force that resists objects sliding past each other. We use products that have increased friction, for example to stop our shoes slipping, or to brake a bike. We also use products that have decreased friction, such as dance shoes that can slide across a floor, low-friction ice skates lubricated by the thin layer of water between the ice and skates, or oil to lubricate moving parts on a machine. This activity with its two parts is a full lesson.